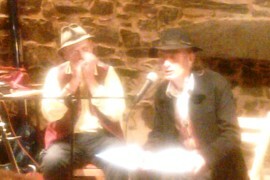 Portsoy's Salmon Bothy was the perfect venue for an evening of poetry and music provided by John Mackie, Neil Hankin and Haworth Hodgkinson. John and Neil performed together as Infinite Equation #2, with Neil's superb banjo playing complimenting John's seductive poetry and guitar playing. A solo number by Neil to finish their first set showcased his song writing skills. As always Haworth's poems reflected his unique take on the world. Many were humorous; others reflected a darker tone, all were thought provoking and most accompanied by Haworth on a variety of instruments. In the second half Haworth was joined by Catriona Yule for a couple of poems, the most striking being Stone to Ice, which Catriona recited whilst Haworth played four gongs, producing an amazing sound experience! John and Neil finished the evening with two more pieces of John's evocative poetry. 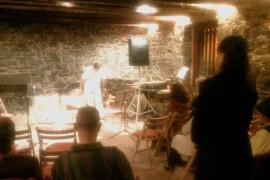 After which the audience very reluctantly started to leave the Bothy! If you missed this gig I strongly recommend that you check out all three artists' websites to find out where you can catch them and obtain copies of their CDs.